In Pisa, Italy, European scientists are pioneering a new way to treat some of the neurological symptoms that can occur in premature births. Babies born early are often more prone to develop neurological problems later in life. But an EU project hopes to change that, by focusing on the play time of young children. Far from child’s play, the tests aim to stimulate the minds of premature babies. “In general, pre-term infants have more chance of developing psychomotor impairment. Our idea was to develop a smart system that could help babies and their parents deal easily, at home, with this situation. We basically wanted to provide parents with a tool that could give them indications on the best ways to stimulate their babies development -by just playing”. With the trials and tests in their infancy, the results are far from conclusive, but already they appear to be showing positive signs. Liam, now just five months old, was born prematurely, he’s been on of the first babies involved in this programme, exercising between 20 and 30 minutes everyday. He’s showing steady progress so far and even seems to enjoy the training. “We are lucky, Liam does not show any particular development problem. Anyway, I really think this prototype is helping him to grow healthy -by playing”. The technology used in these tests was developed by biorobotics specialists. The software seeks to test a babies reaction, with a complex system of sensors that then try to map the infants every movement. “We are able to measure the distribution of the pressure that the infant makes on this motion sensor carpet. That helps us to draw a map to understand how the infant distributes his or her weight on the carpet whilst moving around… We can also measure how the baby moves the arms and the whole body thanks to these sensors attached all around him…And we can also analyse the way the baby manipulates, touches objects around. We’ve inserted different sensors inside these toys”. 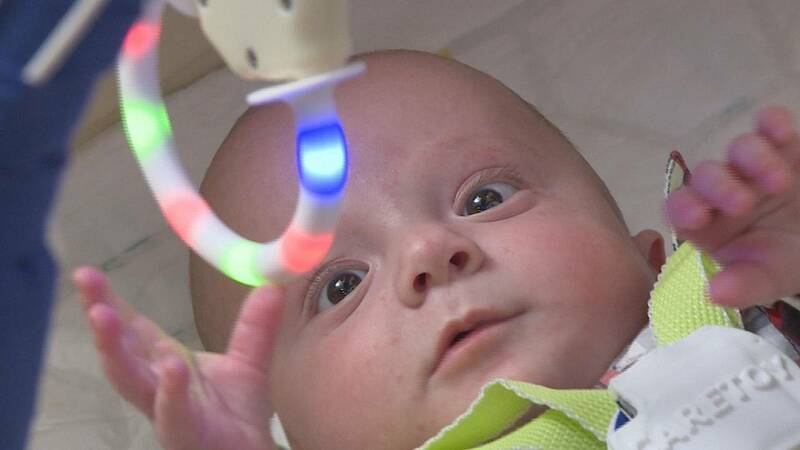 The research is carried out in a clinical environment, where babies are visually stimulated to get further data on their attention and gaze movements. The final aim being to develop even more efficient rehabilitation techniques. Researchers think that one day neurological damage linked to preterm births will not prove fatal -provided babies receive the right stimuli.